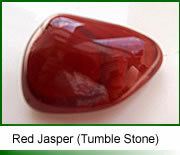 Red Jasper is a naturally occurring gemstone that has a trigonal crystal structure, red jasper being a form of quartz. Quartz is the common name for the crystal form of silicon dioxide whose chemical formula is SiO2. Jasper is a relatively common gemstone that can be found all over the world. It occurs in a wide range of colours including red jasper, yellow jasper, green jasper, brecciated jasper and many others. See also the main IvyRose Holistic section about Crystals & Gemstones. Further information about crystals includes an overview of some of the forms of crystals and gemstones, 'families' of crystals and the gemstones associated with signs of the zodiac.